Have you been called by God to fulfill your mission by establishing a nonprofit organization? If your answer is, “Yes,” then this book is a must-read! 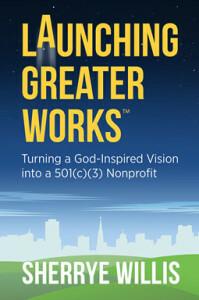 Launching Greater Works™: Turning A God-Inspired Vision into a 501(c)(3) Nonprofit shares Sherrye Willis’ journey of answering her call to serve leaders and organizations working in under-resourced communities. Written for visionary leaders and churches desiring to heal the spiritual, emotional, and physical hurts of individuals and communities through social service delivery or community economic development—Launching Greater Works™ offers spiritual encouragement and practical advice to help you make your vision a reality. Drawing from the Sherrye’s 25 years of experience, discover the steps necessary to successfully turn your God-inspired vision into a 501(c)(3). Get your autographed book today for $12 (plus shipping) or make a $25 or more charitable contribution to Alliance for Greater Works and receive a free book. You will be charged for shipping and handling of the book in addition to your donation amount.